I created today's cards back in December when I first received the Stamp of Approval Young at Heart Collection and am finally sharing them here with you. I created a masculine and feminine version. 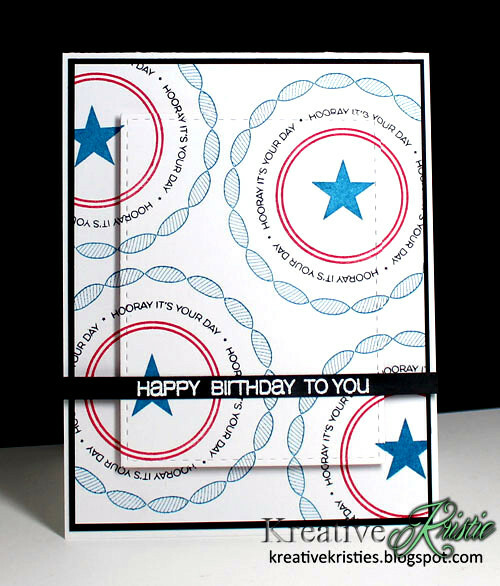 As you can see, I changed up the colors and the stamps from the Ring in the Celebration stamp set to create two different cards using the same stamp set and die. Keeping the scallops for the feminine version and the square for the masculine one. I really do love this collection. So many possibilities. I LOVE seeing all the different creations using this collection popping up all over blog land. Two spectacular cards fresh, dynamic and positively beautiful. Wow - love these two sweet cards Kristie! The masculine card has a bit of a 'nautical' feel to it - I think it is the color combo! Adore the lady version - especially the colors! Did you back the scalloped panel with some pink paper or is it a shadow? Either way - it really works to emphasise the depth of the stamped panel! Really awesome, Kristie! I see you've listed the Quilled tip ... I bought the Fineline - not happy! Does this one work well? Thanks for the advice - or tip, as it were! I do love this stamp set, but have only managed to do a few practicing rounds so far. Love how you created both a masculine and a feminine version. Love this card. So fun Kristie! Way to go, Kristie!! I am in love with this set and your cards are perfect his/hers cards! Love the colours, too! super fun, I always enjoy seeing a masculine and feminine version of a card...these are great Kristie. Funtastic cards, Kristie! Is there such a genre as "clean grunge"? Your masculine card has a look of CAS and yet with the combination of colours used it feels grungey! The feminine colour combo is a fav, gorgeous! Both cards are wonderful and so perfectly stamped! Two fantastic cards. Fun, fresh and funky. Love the way you can completely change the look by interchanging and different inks. Great cads Kristie. I like both versions. Thanks so much for sharing with us at Seize the Birthday. So is the the cut out from the background and just popped up? Or did you have to make two backgrounds the same.